Its an idyllic image as winter gets nearer. Snuggled up on the sofa in front of an open fire with your pet dog or cat next to you. Certainly for your pets its a great place to be. Unfortunately your sofas and chairs may have a different opinion. Your pets winter coats will have more natural oils in them during winter to protect them from the cold and wet and those oils and any dirt on the coat happily will transfer to your upholstery leaving obvious marks where the animal prefers to be. 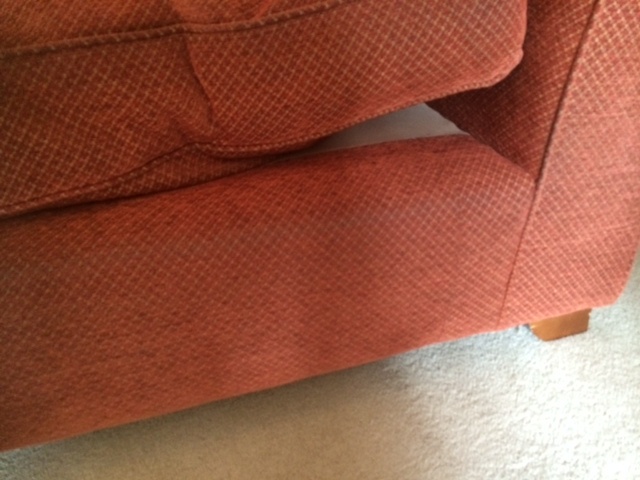 The photos above show a sofa I cleaned this week where the pet dog used it as a scratching post, walking all around the sofa until he was suitably scratched. He is a terrier and the marks you can see correspond with his height. 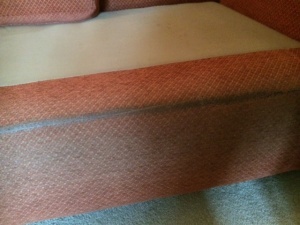 Using our unique colloidal cleaning solution and our advanced low moisture upholstery cleaning techniques I was able to remove the built up oils from the dogs coat from the fabric and return it to look like the rest of the sofa. Additionally the solution also deals with any pet odours in the fabric, not by covering them up but by cleaning away the micro-organisms that cause the smell. All this from a cleaning solution that is pH neutral and is rinsed using fresh water meaning that there is nothing left behind but a clean and fresh sofa.